The Day Started brightly with Bun Kenny recording a 2 straight sets victory over his opponent from Laos in the Tennis Singles winning 6-0, 6-2. 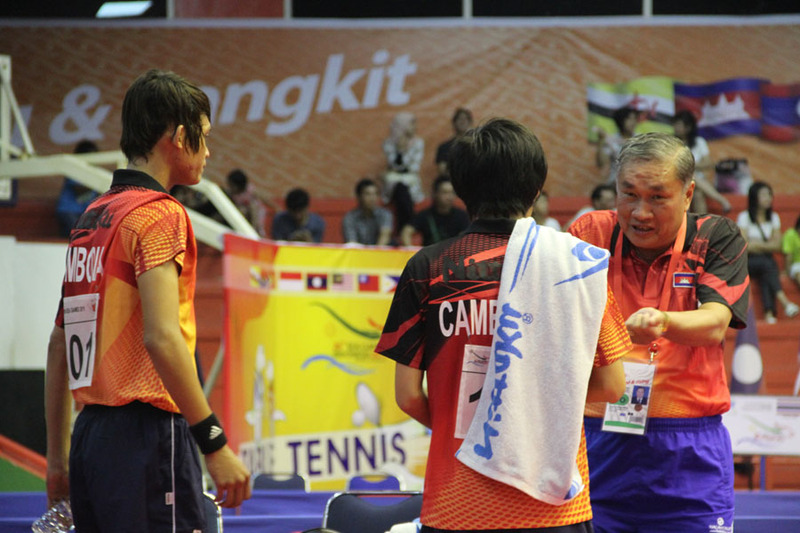 Compatriot Orn Sambath was not so lucky as he fell to Laos opponent losing 6-1, 6-4. Kenny and Sambath then teamed up to pair against Laos for the doubles and had to come from behind to win two sets to one, 5-6, 6-1, 6-0 to qualify for the semi finals. With this victory, A bronze medal is certain for Tennis should they lose the semi finals against Indonesia billed for Monday 14th. Two time SEA games Gold medalist Sok Chanmean could only settle for a bronze medal in the singles after recording 4 victories and suffered 2 loses in the pentanque events. Meanwhile Compatriot Ouk Srey Mom fell out in the first round of the women singles round robin. HemThon Ponloue and Lim Odam both failed to progress to the finals in their respective swimming events. Hemthon competed in the 50m Breaststrokes and returned a time of 00:32:35 which was 2:90secs behind the qualification mark. Lim Odam's 1:06:95 was way off the qualification time for the 100m Butterfly hence could not progress to the next round. The duo of Nay Saravey and Tang Hav dispatched the pair of Timo Leste's Da silva Eliasaray and De Jesus Araujo winning by 3 sets to 1 (11-8, 11-6, 9-11, 11-8)to move to the next round. In the Men Indoor Volleyball, Cambodia Lost to host Indonesia 3-0 (10-25, 22-25, 10-25) and will need to bounce back against Myanmar in the next game on Monday. Long Distance runner Kieng Samorn saw his attempt to make it to the Podium in the 1500 came to an end after he returned in the 9th place with a time of 4:11:26 minutes in a race won by Ridwan of indonesia in a time of 3:47:63 to clinch the gold with leaving Philippine and Malaysia to settle for the silver and bronze respectively. Kieng Samorn will now have to wait for the 800m to stand any further chance of winning something for the Kingdom. The Football team also played their last match at the SEA Games football event which has become a share mis-adventure for the coach Lee Hoon Tae tutored Cambodian U-23. Cambodia received a 4-1 spanking in the hands of the defending champions thus conceding 16 goals ans scoring 2 in 5 games. Chhin Chhoeun who scored the only goal in the 2-1 lose to Singapore gave the Kingdom something to cheer in the second half after Malaysia took a 3-0 lead into the break. The team is set to return to Cambodia on Monday following their early ouster from the tournament.